A crash landing in Taunton left a helicopter on its side seconds after takeoff. 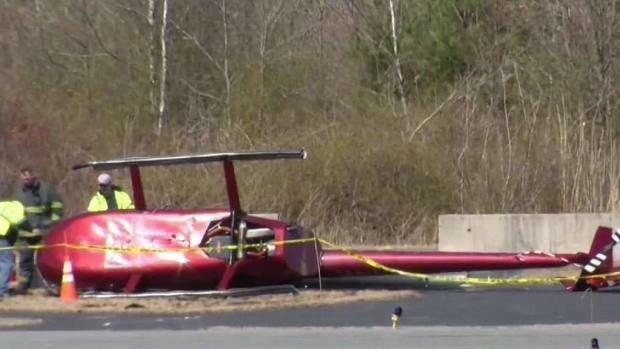 A helicopter's hard landing at the municipal airport in Taunton, Massachusetts, left the aircraft on its side Tuesday afternoon. Emergency responders arrived at the scene just after 12:30 p.m. for a report of a helicopter that had crashed upon takeoff. Neither the helicopter's pilot nor its passenger were injured in the hard landing. They were checked out by paramedics, though, officials said. "One of the operators said he might be sore, but no transport to the hospital and no significant injuries at this time," said Taunton Police Lt. Eric Nichols. "I'm fine," said pilot Richard D'Auteuil. "My ego is hurt." 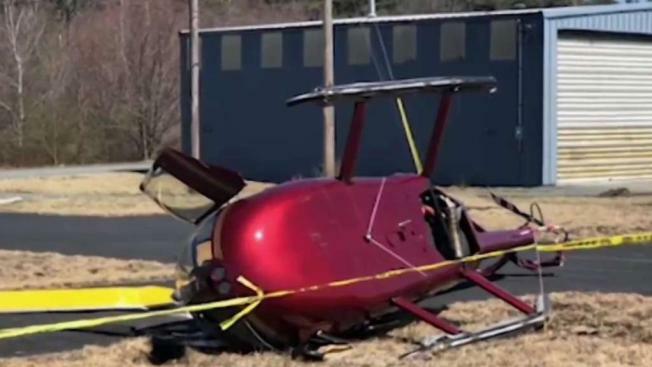 The helicopter's cab and rotor blade were both significantly damaged in the incident, but D'Auteuil was able to shut the down the aircraft, which had originated in New Bedford and landed in Taunton as part of a training program. Authorities say the instructor was piloting the helicopter as they were heading back to New Bedford when the crash happened.